I wasn't sure whether to add this to the multi-day walks or split it into 2 so in the end, opted to write just the one report. This walk is almost exactly as the WH describes it, boggy and pathless, unfortunately, it doesn't tell you how boggy and pathless it actually is or turned out to be. I followed the road up through farm and on to the track which initially was fine and through a couple of gates, this is where it got interesting, squelch, squelch, squelch for about half a mile and I was contemplating putting my gaiters on when suddenly I went though, half way up to my knee, I just thought ******* typical. The path was easy enough to follow up, just follow the deer fence, unfortunately, where the deer fence stops, so does the path. I just followed the river and finally came across a wooden footbridge, over that and just kept on walking towards the dam. After crossing the dam I took a bearing, picked a line and just walked in a straight line towards Sgiath Chuil as I couldn't see anything that even resembled a path, I think by this time I was making heavy work of dragging my carcass up, one wet foot and just constant bog and heather plus looking over towards the bealach was a bit soul destroying, knowing I'd have to descend to it then re ascend up to the Munro top Beinn Cheathaich (how is this not a Munro?) 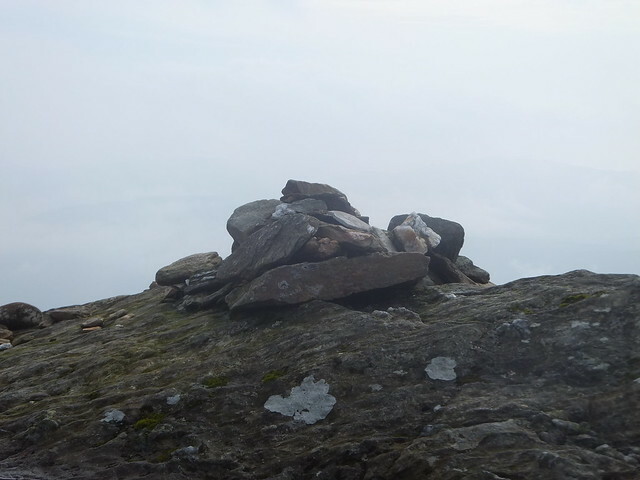 Eventually reaching the summit after about 3 hours, unfortunately after all that hard work, there was nothing to see, photo, quick ciggie then away again. I'd marked on my map where the guide said to descend and then to ascend. The descent as described is bloody steep, I was doing the twist coming down sideways to avoid knackering my knees. Then came the fun part, trying to hit the spot I'd marked on the map to ascend Cheathaich, plenty of bog trotting to be had, couple of times what I thought was solid ground, wasn't and I was just getting wet and miserbale, after about 45 mins of floundering in the bogs I eventually hit where I was aiming for. The ascent wasn't as bad as what I had thought, once I'd talked myself out of heading straight for for the summit, getting up close and personal, going that way gets rather vertical. This is where I met the 2nd group of the day who were doing the round in the opposite direction, brief chat and we headed our separate ways. 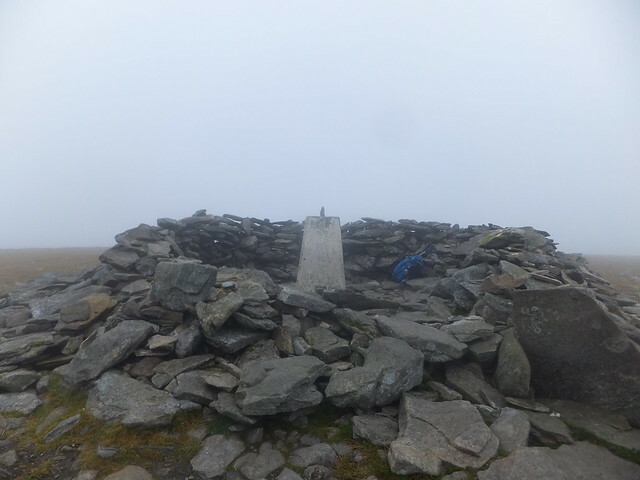 Again once I hit the summit, nothing to see so photo, something to eat and a ciggie and I was away again. 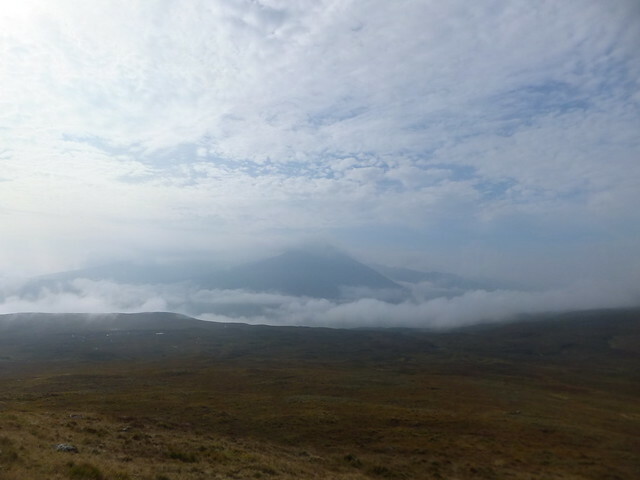 Half an hour later I was at the summit of Meall Glas, I felt absolutely gubbed at this point and a bit annoyed as there really hadn't been much to see all day to detract from the bog and heather. As I sat and chilled a couple of guys appeared, I had to ask them where the path down was, "there isn't one, head in that direction" away I went. Once I got below the cloud line I could see Ben More in almost all its glory but no path, I knew my car was parked just to the left of Ben More so headed in that general direction, after an hour floundering trying not to get anymore mankier I eventually hit a path, probably more by luck than design but I was on the way back, not that the ground underneath improved any. Finally the farm houses came into view and I have never been so glad to get back onto dry land. I got changed and headed off to Pitlochry, my stop for the night. I managed to get my gear cleaned and dried at the Pitlochry SYHA, had my breakfast and set off for Glen Clova. Parked up, paid my £2 and set off, the walk through the forest was a good way to warm the legs up which were still a bit stiff and sore from the previous days exploits, walking through, having a look at the information posts then suddenly WOW, as you emerge from the forest into Corrie Fee is a sight to behold, quite possibly the best looking thing I have ever seen, not from a summit. I stopped to take it all in, have a ciggie and take a few photo's. I spoke to a few folk, think my eyes were like saucers taking it all in. 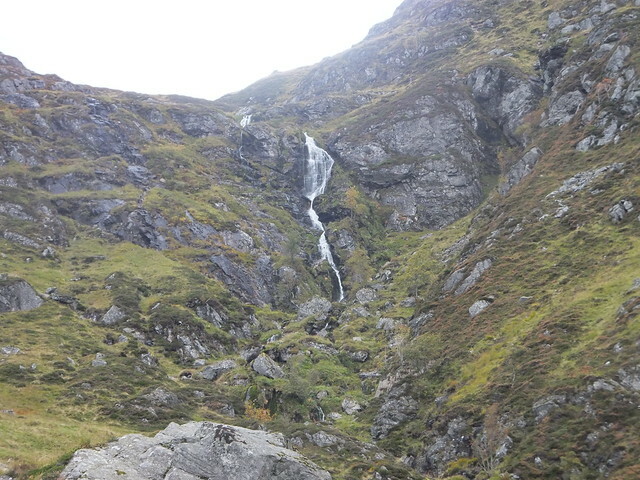 Once I'd calmed down I set off up up the path through the corrie and onto the plateau. This is where things would start to get interesting. 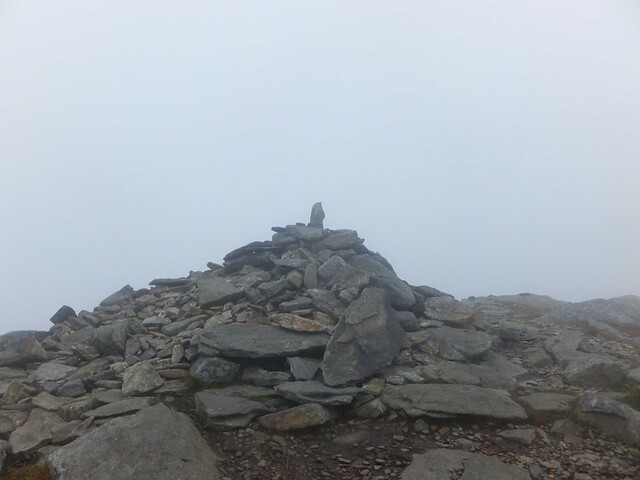 The clag came down hard and you were only seeing vague shapes 100 yards in front of you. 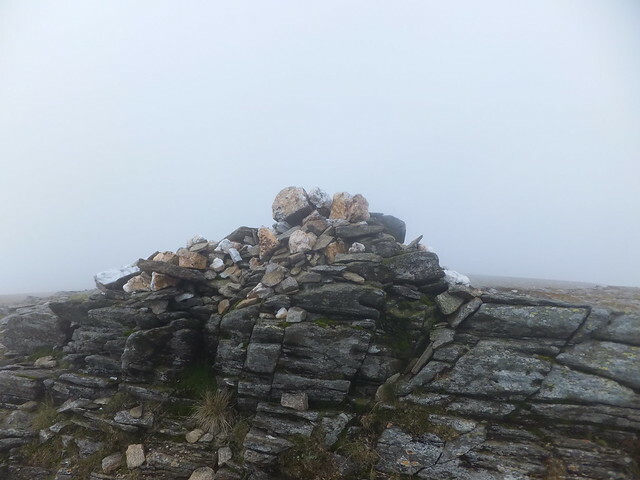 After being trolled by a few boulders I eventually stumbled across the summit of Mayar, like the previous day nothing to see, so did the usual and headed off towards Dreish. 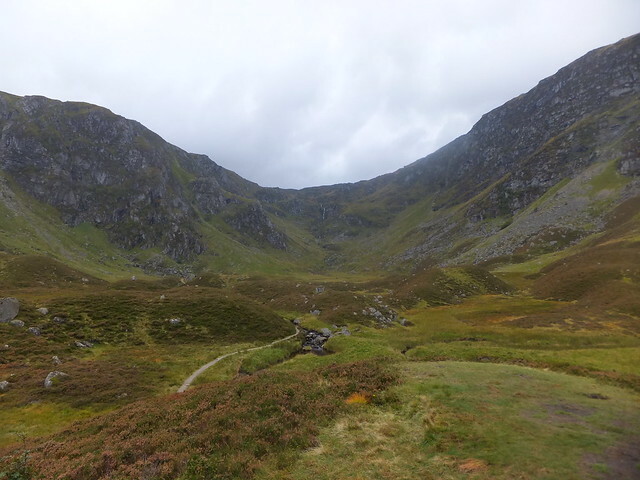 I say set off, after struggling to get a decent bearing, I headed off in the general direction and followed to fence line, which was then occupied by a deer fence, feeling happy that I couldn't get lost I carried on, then I saw the Kilbo path below me. Oops, double checked the map and noticed I should have turned right about a quarter mile back, I about turned and headed back, found the other fence line and followed it. 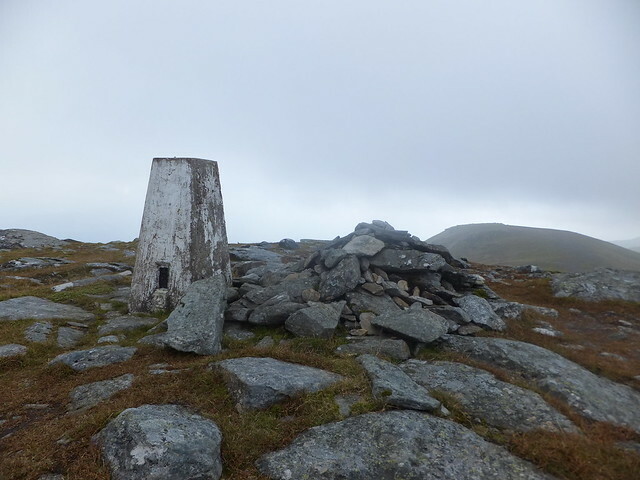 According to my map there was supposed to be something to guide you all the way to the summit, except when the fence ended, so did anything to navigate you to the summit, following a faint path eventually came across a cairn, which initially I thought was the summit but no trig point. Scanned the area and through the clag could just see something ahead of me that was higher up, another false summit but from that I could just make out the shelter and with the trig point in the middle of it, I knew I was at the summit. Getting back down proved to be "interesting" when I hit the 1st cairn I found on the way up, I couldn't see the path I had followed, I kept walking when the ground suddenly got steeper, knowing this wasn't the way I came I contoured to my right around the hill and hit the small ridge, thank god for that. Eventually found the fence line and followed it up to the deer fence where I took a right and just followed it all the way back to the Kilbo path. It was a pleasant walk back through the forest where I bumped into a few of the people I'd spoken to on the way up including a group of ladies who were slightly worried about me being on my tod walking in the pea souper wee had got. All in all it was a good weekends walking and feeling quite proud of myself as if this had been 4 or 5 months ago I'd have never got Mayar and Dreish done as I'd have seized up.